Not to be confused with Red Terror. The first Red Scare began following the Bolshevik Russian Revolution of 1917 and the intensely patriotic years of World War I as anarchist and left-wing social agitation aggravated national, social, and political tensions. Political scientist, and former member of the Communist Party Murray B. Levin wrote that the Red Scare was "a nationwide anti-radical hysteria provoked by a mounting fear and anxiety that a Bolshevik revolution in America was imminent—a revolution that would change Church, home, marriage, civility, and the American way of Life". Newspapers exacerbated those political fears into anti-foreign sentiment because varieties of radical anarchism were becoming popular as possible solutions to poverty, often by recent European immigrants (cf. hyphenated-Americans). 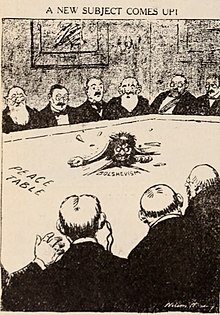 When the Industrial Workers of the World (IWW) backed several labor strikes in 1916 and 1917, the press portrayed them as "radical threats to American society" inspired by "left-wing, foreign agents provocateurs". Those on the side of the IWW claim that the press "misrepresented legitimate labor strikes" as "crimes against society", "conspiracies against the government", and "plots to establish communism". Opponents, on the other hand, saw these as an extension of the radical, anarchist foundations of the IWW, which contends that all workers should be united as a social class and that capitalism and the wage system should be abolished. In April 1919, authorities discovered a plot for mailing 36 bombs to prominent members of the U.S. political and economic establishment: J. P. Morgan Jr., John D. Rockefeller, Supreme Court Justice Oliver Wendell Holmes, U.S. Attorney General Alexander Mitchell Palmer, and immigration officials. On June 2, 1919, in eight cities, eight bombs simultaneously exploded. 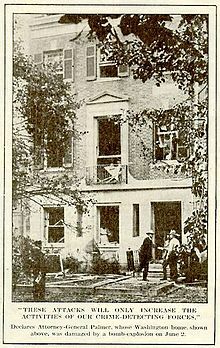 One target was the Washington, D.C., house of U.S. Attorney General Palmer, where the explosion killed the bomber, who evidence indicated was an Italian-American radical from Philadelphia, Pennsylvania. Afterwards, Palmer ordered the U.S. Justice Department to launch the Palmer Raids (1919–21). Yet, in 1918, before the bombings, President Woodrow Wilson had pressured the Congress to legislate the anti-anarchist Sedition Act of 1918 to protect wartime morale by deporting putatively undesirable political people. Law professor David D. Cole reports that President Wilson's "federal government consistently targeted alien radicals, deporting them ... for their speech or associations, making little effort to distinguish terrorists from ideological dissidents." Initially, the press praised the raids; The Washington Post said, "There is no time to waste on hairsplitting over [the] infringement of liberty", and The New York Times said the injuries inflicted upon the arrested were "souvenirs of the new attitude of aggressiveness which had been assumed by the Federal agents against Reds and suspected-Reds". In the event, the Palmer Raids were criticized as unconstitutional by twelve publicly prominent lawyers, including (future Supreme Court Justice) Felix Frankfurter, who published A Report on the Illegal Practices of The United States Department of Justice, documenting systematic violations of the Fourth, Fifth, Sixth, and Eighth Amendments to the U.S. Constitution via Palmer-authorized "illegal acts" and "wanton violence". Defensively, Palmer then warned that a government-deposing left-wing revolution would begin on 1 May 1920 — May Day, the International Workers' Day. When it failed to happen, he was ridiculed and lost much credibility. Strengthening the legal criticism of Palmer was that fewer than 600 deportations were substantiated with evidence, out of the thousands of resident aliens arrested and deported. In July 1920, Palmer's once-promising Democratic Party bid for the U.S. presidency failed. Wall Street was bombed on September 2, 1920, near Federal Hall National Memorial and the JP Morgan Bank. Although both anarchists and communists were suspected as being responsible for the bombing, ultimately no individuals were indicted for the bombing in which 38 died and 141 were injured. In 1919–20, several states enacted "criminal syndicalism" laws outlawing advocacy of violence in effecting and securing social change. The restrictions included free speech limitations. Passage of these laws, in turn, provoked aggressive police investigation of the accused persons, their jailing, and deportation for being suspected of being either communist or left-wing. Regardless of ideological gradation, the Red Scare did not distinguish between communism, anarchism, socialism, or social democracy. The second Red Scare occurred after World War II (1939–45), and was popularly known as "McCarthyism" after its most famous supporter, Senator Joseph McCarthy. 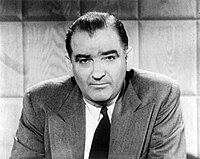 McCarthyism coincided with increased popular fear of communist espionage consequent to a Soviet Eastern Europe, the Berlin Blockade (1948–49), the Chinese Civil War, the confessions of spying for the Soviet Union given by several high-ranking U.S. government officials, and the Korean War. The events of the late 1940s, early 1950s - the trial of Ethel and Julius Rosenberg (1953), the trial of Alger Hiss, the Iron Curtain (1945–1991) around Eastern Europe, and the Soviet Union's first nuclear weapon test in 1949 (RDS-1) - surprised the American public, influencing popular opinion about U.S. National Security, that, in turn, connected to fear of the Soviet Union hydrogen-bombing the United States, and fear of the Communist Party of the United States of America (CPUSA). In Canada, the 1946 Kellock–Taschereau Commission investigated espionage after top secret documents concerning RDX, radar and other weapons were handed over to the Soviets by a domestic spy-ring. At the House Un-American Activities Committee, former CPUSA members and NKVD spies, Elizabeth Bentley and Whittaker Chambers, testified that Soviet spies and communist sympathizers had penetrated the U.S. government before, during and after World War II. Other U.S. citizen spies confessed to their acts of espionage in situations where the statute of limitations on prosecuting them had run out. In 1949, anti–communist fear, and fear of American traitors, was aggravated by the Chinese Communists winning the Chinese Civil War against the Western-sponsored Kuomintang, their founding of the People's Republic of China, and later Chinese intervention in the Korean War (1950–53) against U.S. ally South Korea. A few of the events during the Red Scare were also due to a power struggle between director of FBI J. Edgar Hoover and the Central Intelligence Agency. Hoover had instigated and aided some of the investigations of members of the CIA with "leftist" history, like Cord Meyer. This conflict could also be traced back to the conflict between Hoover and William J. Donovan, going back to the first Red Scare, but especially during World War II. Donovan ran the OSS (CIA's predecessor). They had differing opinions on the nature of the alliance with the Soviet Union, conflicts over jurisdiction, conflicts of personality, the OSS hiring of communists and criminals as agents, etc. By the 1930s, communism had become an attractive economic ideology, particularly among labor leaders and intellectual elites. By 1939, the CPUSA had about 50,000 members. In 1940, soon after World War II began in Europe, the U.S. Congress legislated the Alien Registration Act (aka the Smith Act, 18 USC § 2385) making it a crime to "knowingly or willfully advocate, abet, advise or teach the duty, necessity, desirability or propriety of overthrowing the Government of the United States or of any State by force or violence, or for anyone to organize any association which teaches, advises or encourages such an overthrow, or for anyone to become a member of or to affiliate with any such association"—and required Federal registration of all foreign nationals. Although principally deployed against communists, the Smith Act was also used against right-wing political threats such as the German-American Bund, and the perceived racial disloyalty of the Japanese-American population, (cf. hyphenated-Americans). In 1941, after Nazi Germany invaded the Soviet Union, the CPUSA's official position became pro-war, opposing labor strikes in the weapons industry and supporting the U.S. war effort against the Axis Powers. With the slogan "Communism is Twentieth-Century Americanism", the chairman, Earl Browder, advertised the CPUSA's integration to the political mainstream. In contrast, the Trotskyist Socialist Workers Party opposed U.S. participation in the war and supported labor strikes, even in the war-effort industry. For this reason, James P. Cannon and other SWP leaders were convicted per the Smith Act. In March 1947, President Harry S. Truman signed Executive Order 9835, creating the "Federal Employees Loyalty Program" establishing political-loyalty review boards who determined the "Americanism" of Federal Government employees, and recommended termination of those who had confessed to spying for the Soviet Union, as well as some suspected of being "Un-American". It also was the template for several state legislatures' loyalty acts, such as California's Levering Act. The House Committee on Un-American Activities (HUAC) and the committees of Senator Joseph McCarthy (R., Wisc.) conducted character investigations of "American communists" (actual and alleged), and their roles in (real and imaginary) espionage, propaganda, and subversion favoring the Soviet Union—in the process revealing the extraordinary breadth of the Soviet spy network in infiltrating the federal government; the process also launched the successful political career of Richard Nixon, and Robert F. Kennedy, as well as that of Joseph McCarthy. Senator McCarran introduced the McCarran Internal Security Act of 1950 that was passed by the U.S. Congress and which modified a great deal of law to restrict civil liberties in the name of security. President Truman declared the act a "mockery of the Bill of Rights" and a "long step toward totalitarianism" because it represented a government restriction on the freedom of opinion. He vetoed the act but his veto was overridden by Congress. Much of the bill eventually was repealed. The Second Red Scare profoundly altered the temper of American society. Its later characterizations may be seen as contributory to works of feared communist espionage, such as the film My Son John (1952), about parent's suspicions their son is a spy. Abundant accounts in narrative forms contained themes of the infiltration, subversion, invasion, and destruction of American society by un–American thought. In science fiction movies like The Thing (1951), tales of alien humanoid beings abounded. Even a baseball team, the Cincinnati Reds, temporarily renamed themselves the "Cincinnati Redlegs" to avoid the money-losing and career-ruining connotations inherent in being ball-playing "Reds" (communists). In 1995, the American government revealed details of the Venona Project, which when combined with the opening of the USSR ComIntern archives, provided substantial validation of intelligence gathering, outright spying, and policy influencing, by Americans on behalf of the Soviet Union, from 1940 through 1980. ^ Levin, Murray B. (1971). Political Hysteria in America: The Democratic Capacity for Repression. Basic Books. p. 29. ISBN 0-465-05898-1. OCLC 257349. ^ "Preamble to the IWW Constitution". Industrial Workers of the World. Retrieved 2009-08-20. ^ a b Cole, David D. (2003). "Enemy Aliens" (PDF). Stanford Law Review. Stanford Law Review, Vol. 54, No. 5. 54 (5): 953–1004. doi:10.2307/1229690. ISSN 0038-9765. JSTOR 1229690. OCLC 95029839. Archived from the original (PDF) on May 3, 2011. ^ Farquhar, Michael (2003). A Treasury of Great American Scandals. Penguin Books. p. 199. ISBN 0-14-200192-9. OCLC 51810711. ^ Hakim, Joy (1995). War, Peace, and All That Jazz. New York, New York: Oxford University Press. pp. 34–36. ISBN 0-19-509514-6. ^ Gage, Beverly (2009). The Day Wall Street Exploded: A Story of America in its First Age of Terror. New York: Oxford University Press. pp. 160–161. ISBN 978-0-19-514824-4. OCLC 149137353. ^ Kennedy, David M.; Lizabeth Cohen; Thomas A. Bailey (2001). The American Pageant. Houghton Mifflin Company. ISBN 978-0-669-39728-4. OCLC 48675667. ^ O. Dickerson, Mark (2006). An Introduction to Government and Politics, Seventh Edition. Toronto: Nelson. ISBN 0-17-641676-5. ^ Johnpoll, Bernard K. (1994). A Documentary History of the Communist Party of the United States: Volume III Unite and Fight, 1934–1935. Westport, Connecticut: Greenwood Press. pp. xv. ISBN 978-0-313-28506-6. OCLC 27976811. ^ Countryman, Edward (2010). "Communism". In Kazin, Michael; Edwards, Rebecca; Rothman, Adam. The Princeton Encyclopedia of American Political History. Princeton, NJ: Princeton University Press. p. 175. ISBN 0-691-12971-1. OCLC 320801248. Retrieved May 3, 2011. ^ "The Hiss Case in History". The Hiss Case in Story. Harvard, NYU. 2009. Archived from the original on May 4, 2011. Retrieved 2010-07-28. ^ Lane, Frederick S. (2009). American Privacy: The 400-year History of Our Most Contested Right. Boston: Beacon Press. p. 130. ISBN 0-8070-4441-5. Retrieved May 3, 2011. ^ "Venona and the Russian Files". The Hiss Case in Story. Harvard, NYU. 2010. Archived from the original on May 4, 2011. Retrieved 2010-07-28. ^ Commission on Protecting and Reducing Government Secrecy. "A Brief Account of the American Experience" (PDF). Report of the Commission on Protecting and Reducing Government Secrecy. VI; Appendix A. U.S. Government Printing Office. pp. A–7. Archived from the original (PDF) on May 4, 2011. Retrieved 2006-06-26. K.A. Cuordileone, "The Torment of Secrecy: Reckoning With Communism and Anti-Communism After Venona," Diplomatic History, vol. 35, no. 4 (Sept. 2001), pp. 615–642. Albert Fried, McCarthyism, The Great American Red Scare: A Documentary History. New York: Oxford University Press, 1997. Joy Hakim, War, Peace, and All That Jazz. New York: Oxford University Press, 1995. John Earl Haynes, Red Scare or Red Menace? : American Communism and Anti Communism in the Cold War Era. Ivan R. Dee, 2000. John Earl Haynes and Harvey Klehr, Venona: Decoding Soviet Espionage in America. Cambridge, MA: Yale University Press, 2000. Regin Schmidt (2000). Red Scare: FBI and the Origins of Anticommunism in the United States, 1919-1943. Museum Tusculanum Press. pp. 1–391. ISBN 978-8772895819. OCLC 963460662. Murray B. Levin, Political Hysteria in America: The Democratic Capacity for Repression. New York: Basic Books, 1972. Ted Morgan, Reds: McCarthyism in Twentieth-Century America. New York: Random House, 2004. Robert K. Murray, Red Scare a Study in National Hysteria, 1919–1920. New York: McGraw-Hill Education, 1964. Richard Gid Powers, Not Without Honor: A History of American Anti-Communism. New York: Free Press, 1997. Ellen Schrecker, Many Are the Crimes: McCarthyism in America. Boston: Little, Brown, 1998. Landon R.Y. Storrs, The Second Red Scare and the Unmaking of the New Deal Left. Princeton, NJ: Princeton University Press, 2012. "Political Tests for Professors: Academic Freedom during the McCarthy Years" by Ellen Schrecker, The University Loyalty Oath, October 7, 1999.